Time to look at what has been invalidated from my Q1 analysis. I am no permabear. I played equities long-only from 2009 through to 2013 but by the end of 2013 there was an impressive congregation of topping indicators, which aligned with a predicted peak in the solar cycle. Adding in my demographic research, the case was particularly compelling to short stocks and hunt for a major peak. So I decisively switched teams. That compelling bearish case still stands, as just a couple of weeks ago I produced a list of 30 indicators advocating short. See that list here. In short, focussing on US stock indices, whether we look at valuations, bull market characteristics, sentiment, euphoria, leverage, IPOs, equity allocations, smart money flows, breadth divergences and other indicators with reliable histories, we have a case for a top in US equities. Add them all together, and it’s just about the timing. Therefore I don’t understand shorters throwing in the towel at this point, and particularly because as things stand, US stock indices have traded sideways in 2014. There is no definitive bull or bear trend, and at the time of writing 3 of the 4 main US indices are below their Dec 31 close, whilst only marginally so. Price has only paid for short term trading over the last 4 months, and the rest of us are patiently – or impatiently – waiting. Pending that resolution, beware the price-cheerleading from both bull and bear camps, thinly disguised as analysis. So, with that multi-angled case for a top, why have stocks not fallen decisively yet? I argue that the reason is the solar cycle maximum extending beyond the predictions of the major solar scientists, and its implication on speculation in the markets. However, by indicator extremes and similarities, the set up remains for a crash in the markets and the delivery of those waterfall declines as the peak leverage is unwound. But, for now, the stock indices have morphed into sideways ranges, as the solar maximum has extended. The solar maximum, through human excitement, influences speculation and also economic activity. Once the solar maximum begins to wane I expect both to ebb together, and I therefore consider this one of the most important items to track. Should the solar maximum not peak out until mid-2014 then I would look to the possible analogs of 2011 and 1987 as price guides. Both these analogs shared similar indicator extreme readings and backdrops, and both saw waterfall declines in the Fall/Autumn. 2011 produced a long sideways range ahead of the falls, whilst 1987 eked out further price gains in the summer, before the falls. My approach is to stay short and attack short until we see the major declines, shearing off profits as I see fit based on the short term action, and should stocks eke out further new highs before the falls, as per 1987, then my current exposure can cope with that. Should the smoothed solar maximum be behind us, and sunspots wane from here, then those Q1 2014 trading ranges in the indices may turn out retrospectively to be the beginning of a new downtrend, made clear by imminent sharp falls (declines from here would fit the Presidential cycle). In support of that possibility, my January call that the Dow and Nikkei peaked 31 Dec still stands at the time of writing, and my March 2 call that the Russell 2000 and Biotech sector peaked out around last day of Feb is so far accurate. From a bullish perspective, cumulative advance-declines continue to support, and cyclical sectors recovered after their January sell-off. Gold and miners have fallen back since mid-March. Leading indicators suggest a pick up in global industrial production as of mid-May, so that could become a tailwind if stocks do not significantly sell off over the next couple of weeks. Q1 earnings are projected to produce an overall decrease in earnings, for the first quarter in some time, but thus far we do not see overall bearish price reaction to those that have reported. Economically, we do not yet see the tip into outright deflation or negative growth, but I expect that to come hand in hand with the stock market declines post-solar-maximum, i.e. sharp stock market declines will affect the economy and vice versa, all guided by the sun’s influence on people. My Q1 2014 ‘misses’ in terms of analysis can be summed up as impatience over the sharp falls into a definitive bear trend, but I believe the reason for that is the extension of the solar maximum, which was unknown at the time. The bulk of my analysis still stands, and will continue to do so until that definitive selling erupts. In the near term I am looking at market reaction to earnings, how price behaves into the new moon at the end of April, and the indicator reports at the turn of April-May for sunspots, margin debt, and more. I am adding short into the stock market rallies, such as this 6-day rally into today, looking to short term indicators for overbought/exhaustion. I am also watching commodities to see if they can continue to rally as a late cyclical class (considering gold separate) which typifies a top, but I have been taking profits on commodities positions as I have my doubts about the longevity of their rally due to deflationary/recessionary pressures. Potentially reflecting such pressures, treasuries have continued to perform since their turn-up as of the start of January and are another clue into what lies ahead. Thanks for the continued articles. I think this year the sell in may will work along with the historic poor performance during the second year of the presidential cycle. Add to that multiple indicators you highlight and the fact that QE is being tapered back I think a summer correction is likely. Worth noting that the dow is carving out what looks to be a head and shoulders pattern on the daily chart. If the right shoulder completes over the next few days we should see the declines begin soon. All the best. Good to see you back on top form. Something interesting as it relates to the topping patterns from the above four charts. Take a look at the S&P 60 minute over the last 6 weeks. The chart pattern looks very similar to the 1987 topping pattern and similar to the rest. Wonder if we are looking at the beginnings of a Flash Crash on an hourly basis or maybe something on an even bigger time frame. The 1650 to 1700 area will bring in a 61.8% Fib retrace back to April 2013 lows and that area is only a 10% to 12% correction from the recent high. We are getting a 10% or 12% correction again in our life times, so please let us not kid ourselves. Also for the bullish scenario, and assuming that the top is not in, there isn’t enough juice I think to get this to the 1950 to 2000 area as the Megaphone pattern shows at this point. A dip to the lower range of the pattern would bring in the added fuel to bounce this to that area. A September 5th, 2014 date would be about the time the S&P would hit 2000. Now that would set up some fun in September , October , No? Thanks John for your posts. Another couple of indicators of a bull market top are the action of high growth shares and the rotation of money into less exciting sectors. A sign of a bull market top is that the leading growth stocks in the current bull market start to break down first and have broken chart patterns. This tends to happen before the actual indexes break down. This is a signal from the CANSLIM school of growth stock trend following, pioneered by William O’Neil. 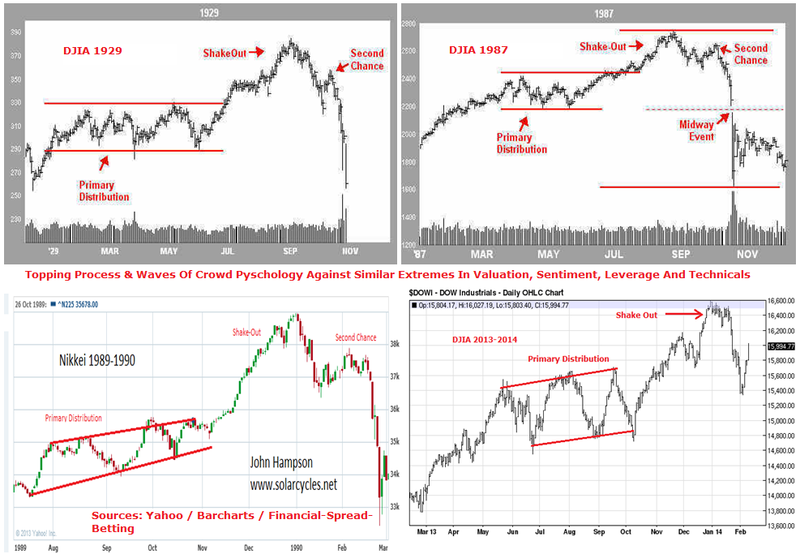 A follower of this style of trading, Dan Zanger, recently observed that “The bad news is that most leading stocks continue to lag and have charts that are so broken up it could take months for them to rebuild”. This mirrors your observation that high momentum stocks have declined rapidly recently. I guess what I do not agree with right now is a waterfall decline. The fed is tapering, but still billions of $ are pumped into the economy currently. I think this is what John might be missing. One of the other problems is that the managers of the funds have been trained for years and have ingrained in their psyche that as long as interest rates are not rising all is well with the world. Logic sometimes has to take a back seat to the power of money. I continue to trade the swings and just hit singles and doubles until the event happens. I’m in your camp. New indications of a waterfall collapse continue to grow yet little has happened. The only thing not cooperating yet is the solar cycle. Take a look at $TNX on the weekly chart 1997 to present with 50/200 Simple MA and RSI (14). I believe 10 year Treasuries will be the “canary” to watch. WE ARE IN the DANGEROUS PORTION of the MARS-URANUS CRASH CYCLE DURING LATE DECEMBER! We expect a CRASH by mid-Jan 2015 Latest! WE BELIEVE THE BEST BETS for a CRASH THIS YEAR are APR-MAY-JUNE & OCT.
That does NOT mean that there will be a market Crash right now! What it does mean is that EVERY CRASH in the last 100 years has occurred during This Portion (40%) of the Mars-Uranus Cycle. It does NOT Mean that there will be a Crash during any one repetition of this cycle. However, the psychological and technical conditions are already confirming that potential! This is from Arch Crawford of Crawford Perspectives. It didn’t paste the soucre. Arch is useless…remember his calling for a crash in 2012/early 2013 via his “Cardinal Climax”? Thanks for your investigation and logical assessment of ideas and strategy. We appreciate you sharing them. Daneric has moved the goal posts for the Elliott Wave count for the final wave 5 to play out over the next few months possibly reaching into the fall. So there is an Elliott count that supports a top in the next few months. David Nichols wrote a piece called the 64-Month Bubble Pattern. In it he surmises that crashes are caused by fractal growth patterns that have a lifespan of 64-65 months. That would put this expansion in the SPX at 64 months in June and 65 months in July. He goes on to say that the final two months of fractal bubble growth patterns have a tendency to be parabolic in nature. So the bulls may have a few more months of stock gains. Thanks again John for your kind sharing. Daneric has been moving his count to the end for 3 years now. Read here not there. John, the page didn’t want to format correctly, either try, not sure why. That is why I repeated the post. It looked ok in the text box. Once again retail investors are being sucked in by a opportunistic AAPL report. i suspect we see a “dump and run” by smart money today. Forget cycles and charts and Fibonacci retracements. As I have written all along, you should base your long/short decisions on the 10-Year Treasury Note which continues to be bullish for stocks. Can I request you to please elaborate further? Are you talking about FED model? or something else? 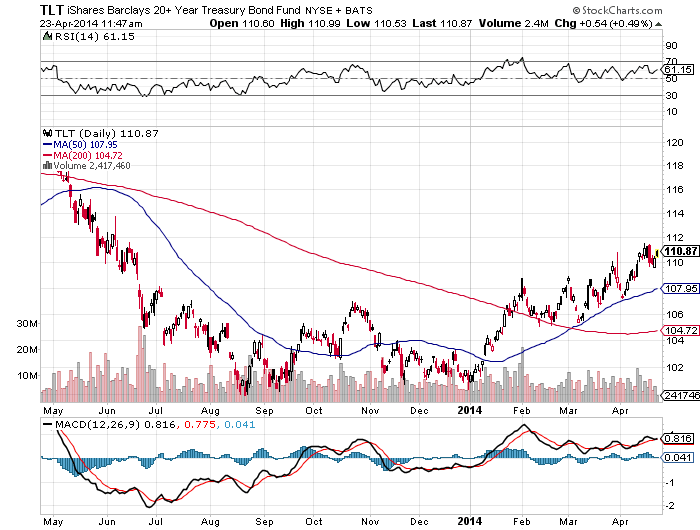 Ditto….10 yr treas yield bullish for stocks..Really? Money being tapered (just ask Yellen)..while credit creation diminishes (just look at home sales). In the meantime, $TNX has rolled over since Dec 2013 and it scores a bearish cross (200 day MA over 50 day MA). It is looking more and more “RISK-OFF” to me. In reference to a comment you made about a possible double solar peak, some time ago on your site I posted an article about a double solar peak in 2014. The double peak prediction was made by a member of the NOAA/NASA Solar Cycle Prediction Panel, a group of solar physicists who assembled to forecast the next Solar Max. This and other market indications led me to believe that the 2014 market peak would be sometime around the Jul – Sep time frame. But there would be a bounce in 2015 because of the year ending in 5 market theory. many thanks for your valuable contribution to the trading and investment community. Longer term I am certainly seeing a potential top around December 2014. I am prepared to go out on a limb here and state that gold is now nearly set for a substantial rise. Yesterday was a significant day for gold. Looking at the longer term chart gold made a double bottom In June/December and has since that period traced out what appears to be a Head and Shoulders continuation pattern. (yes such a pattern does exist). I am going significantly long gold on further strength. Just to add. The USD looks to be in big trouble here. I’ve asked before about what scenario could have a negative impact on both the USD and US stock markets? Could the US be about to face a US centric bank implosion or US bond crisis that catapults gold higher? If the dollar breaks that lower long term support things are going to get very interesting very quckly. Since virtually everything I read about the $ is bearish, I am tending bullish. Is there something magic about @ 1900?. I don’t know but there is an interesting article on themarketoracle.co.uk titled, Has the Stock Market S&P Topped at Exactly the Same Price as Gold? It also recounts many of the extremely bearish indicators John has already pointed out. Long duration disagree. Look at TLT. I have posted Barry Bannister’s work and he is calling a flat 2014…a market consolidation. I am looking for a retest of the Feb low. In the meantime, Treasuries are king. Here is Bannister’s 2014 prediction again. This is much like examining the market, assessing probabilities, considering alternative points of vue, and keeping the finger on the pulse of price action. Old John the Amalgamator is back. I went long around SPX 1864 close to where the market closed last Thursday (weekly close). The low so far at 1861 is where the 30-day MA is. The 50-day is 1858. I think we will make new highs next week rally into FOMC’s Wednesday and if it does, I hope no one claims the market is manipulated or saved by the Feds or something like that. Lol, no market manipulation at all. Just POMO, HFT linked to user pay advantages, publicly acknowledged PPT, etc etc etc. Yes, the market is manipulated : big fish push the market by force, small fry pray to their Gods so they break the fins of big fish. Therefore I won’t trade anymore, manipulation is unfair! And so inefficient, since PPT was introduced, we had bear markets and crashes anyway. This ain’t no right. I believe most of it to be bunk; and will be called by some a heretic of sorts; but want to keep an open mind regards researching the topic. One of the problems is that I am coming from the direction of first being an investor; and then want to determine for myself any usefulness regards predictable patterns of statistical significance. Another chance here. Selling into Friday’s close, Monday/Tuesday at the new moon and in April equals possibility of steep falls, by history. F2, F3, Post, P2 – two days before FOMC statement and two days after – are usually dodgy days, disregarding rules applying to HTF units. If the month is choppy (Dec13) and the price finds it diffucult to go away from open at one swing, on these days it may speed off open like Louis Hamilton does it from P1. Also days before FOMC are quieter than usual, while P2 often behaves like FM, LM – first and last session of the month – where money flows move the market easily back and forth without creating a regular or lasting trend. Just some boring daytrading stuff, and of course an exception doesn’t make a rule, and rules don’t apply to all cases. Therefore I skip HTF suggested trades on these days, especially that I might have a nice profit, which would dissapear a few minutes after Wednesday statement. What is HTF, FM, LM? In the last year, there were 4 instances of a Monday two days before FOMC Wednesday, in range bound DJIA on hourly basis, in similar volatility/choppiness – measured by myself by looking at the price behaviour in the band of 40 points in the first half hour of the session :April 29th, 2013, June 17th, 2013, Dec 16th, 2013, March 17th, 2014. In all cases the market opened with a gap up. In thee instances the price went fast up around 100 points off the open, in two instances stayed there for the rest of the session, once went back down two hours before close. In one case the price tested down for 30 points into the previous session value, then reversed and went up for 100 points, closed around there. So we had 4x gaps up and 4x up days on similar Mondays…as an contarian, I will short all gunz blazing today, just kidding. Okay; I see we are allowed to speculate here. So here goes nothing. My astrocycle analysis tells me this: We are now in a w4 (of 5) that follows the dec 2013 top of 3 (of 5). We are now in the third 23 month mars cycle from the beginning of 2009. This cycle will complete half a jupitercycle. And that targets the end of 2014 as a top of 5. The S&P is in a running flat; so the recent ATH doesn’t mean that we can’t be in W4. W4 will bottom around july 15th. But first we’ll see a low tomorrow and then an abc up to may 25th. Then ABC down into july. Then we’ll see 5 of 5 running into november 20-22. Momentum peaks in W3. So all John’s divergences are for real. But W5 should see divergences and still the market will go up. W5’s truncate when W3 (lets say from 1972 to 2000) has gone ‘too far too fast”. So a truncation is possible. That would give us a trading market for the next. months. But my cycles give me timing, not price. So we’ll see what the market does. But I wouldn’t count on a bearmarket before november 2014. After that, who knows. Want to agree on W4, waves have shown that they need the full and uninhibited scope consideration. My longs are solidly in the green now and Remember Tuesday is always up. Shorts are toast again. So what’s the score? who’s toast at the close of a very dodgy day? I am glad I took profit at 497 and went gardening. A NOTE-price now at level in indexes computers want to defend… if they can not, they may withdraw and let market fall….we shall see…. a note on the 886 algo….. at the double pink arrows, price retraced to the 886 to the penny on a day that opened on gap on 5 with the gap holding the required 5 minutes……. but NEVER FORGET the third component of the algo is price at line from medianline set…. in this instance…. was nowhere to be found…. those who traded the 886 without COMPLETE setup paid the price….. Huge reversal in Dow! What do you guys make of that? I’m still short on Dow and plan to remain short. TA has many names, and it’s amazing that various non related tools can generate profits. Basically, a trader can master an unique set up and make a living, but unfortunately what is perceived as technical analysis by the public and non pros has nothing to do with real technical analysis. I am especially allergic to a specific use of TA – random implementation of some mythical and vague technicals tools to justify one’s position in the market or one’s personal market bias. I would say that the more invidual calulations, the more they are succesful. I personally don’t use median lines, no Fibos, no RSI, no MACD, no BBs, etc. I even don’t draw trend lines. For me, a channel is over after a number of closes below high, above low, while the trend line hasn’t been violated yet. What I use is EMAs, candle patterns, and my own levels, most of which are based on Market Profile, this is why I closed yesterday my long DJIA trade at 16497. As long as Market Profile is not on front pages of TA for novice traders, it is bound to continue to do well. ps.I disagree with your opinion that cumputers run the market. Of course there are a lot of back boxes out there, but they are set, adjusted and many times just turned off by humans. There is a lot of powerfull human traders as well, who trade by hand, using cumputers for execution, online live sessions and study of documents. Nobody, no thing run the market. Market goes on it’s own. On the other hand, the concept of median lines looks interesting. It respects the truth that for the market the most important are recent events. The market doesn’t care about what happened 5 years ago; yesterday’s level is more important that last Thursday level, open level is more important than previous session close. Like in a class room, the most attention gets latest news. In the end,each trader CHOOSES a methodology to stake their family’s well being upon….It is the mastery of and commitment to a specific methodology that makes the difference… not the specific methodology itself. Having seen traders succeed using incredibly diverse methodologies I long ago stopped commenting on other traders way of approaching the markets… I just show what I am doing and thinking and hope some will find value or some small insight. Like I said yesterday: we will see a low on monday and then up to 25th of may, with first a high on the 6th, and a low on the 14th. Those are all very interesting dates you have been talking about Andre. November 2014 would also happen to correspond with the 1929 Dow high, if SC24 continues its similarity to SC16. There is no indication that sunspot numbers will decline significantly before then, because the solar field strengths are continuing to decline backwards towards zero (these measurements are smoothed, so will change for six months following the date to which they relate). You also mentioned mid July 2014, which coincides with a critical Fibonacci timeline marking the end of gold’s bearish phase (previous timelines in this sequence were late December 2013 and late June 2013). We are almost at a new moon, which normally marks a high for stocks. But that lunar cycle is usually inverted when the new or full moon coincides with a major Bradley or pair of minor Bradley turns. We are between a close pair of minor turns now, so that adds weight to your low today. Mid July and late November are also huge Bradley turns. Nice to see confirmation. I use different timing techniques. I think we have 3 different forces that affect human mood : electric, magnetism and gravitation. They all have an impact. Only when you combine them you can hope for perfect timing. One advantage of gravitation is that it is easy to forecast. So my low yesterday was based on a peak in gravitational pull yesterday evening. The next low in gravitation is Friday night, So gravitation gives an uptrend. Monday also had a bradley low. Bradley is not gravitational. So 2 different techniques that give the same timing is confluence. Thanks for your valuable comments. I do not understand wave count much but I can see that you expect US market to go down up to July 15, 2014 and then final upmove and peak around Nov 2014. However I did not understand ABC you mentioned about possible minor waves both – up and down so can I request you to please mark all wave counts and give us link? There can be little doubt that stock markets are now dominated by HFT, POMO, Fed minutes and economic data that is so far from anything that is even close to reality as to be laughable. Gone are the days when a single ordinary investor armed with a basic knowledge of what constitutes sound investing on the principles solid fundamentals and technicals could make reasonable decisions that more likely than not woould lead to profits. Companies now sell at astronomical levels based on little to no earnings, or even negative earnings, indices trade at near historic valuations and yet we hear over and over how much value is in the market and why markets will press higher on the principle that, well that is just the way the market is. No longer do we hear reasonable arguments as to why stock prices justify these levels. All I hear is why the market must go higher because. Just BECAUSE! This market no longer functions as anything other than a ponzi scheme to fleece the unsuspecting masses of further and further investing dollars. It was never a totally level playing field, but at least when I began my investing career many years ago one could eek out a reasonable living. Not anymore. This market has becaome nothing more than a cesspit of greed and dishonor and win at any cost by any means. It is a broken market. I have little doubt that it will eventually meet its doom. And by that I mean a point where the whole market system meets total collapse and becomes unworkable and needs to be rebuilt. For dog will eventually eat dog. I from this moment on plan to no longer risk anymore of my years of hard earned capital in a market which is so far out of skew as to be a complete disgrace to anything even remotely based upon logical investing. Another bear bites the dust it appears. Its called a bull market. It’s called knowing when to quit a corrupt system and having the foresight to realise that NOBODY will profit from the coming financial collapse. I am an Ex MF Global Australia account holder and trader. I had my accounts frozen overnight. All my open contracts were cancelled. Those that were in the money will never ever be paid up. I am still battling to recover my account funds and will never recover in full what was rightfully mine. The point being? There will be no winners from this when it finally collapses. Just as my contracts were voided with the collapse of MFG, so too when the markets collapse even those with winning positions will lose. You will never collaect on anything. I grew up thinking that the US market system had rules in place to protect all. Alas the US in THE center of corruption. Corrupt to the core. The SEC turned a blind eye to Bernie Madoff for years, it has allowed HFT to takeover the markets and scalp smaller traders. The US enforcement agencies stood by and dd zero to prosecute Corzine. Nothing to prosecute anybody in regard to the fraud surrounding rerating of home loans that lead to the GFC. When it comes to corruption the US makes Russia and China look like an angels. I’m done. I stand by what I am saying now. When the collapse comes, it will be so fast that nobody, even the winners, will collect. Allen: it took a lot of guts to articulate these thoughts; which are my sentiments exactly! You make many excellent points most of which are spot on. I too once made a living as a trader; and quit when I was ahead after arriving at the same conclusions. This will not end well as you say. Nice to see something other than short term trading posts.